ENSENADA, Baja California, Mexico—Celebrating its first year as the television broadcast partner of SCORE International, the El Rey Network has announced two one-hour specials to launch its coverage of the four-race 2017 SCORE World Desert Championship. The first show, to air on May 31, will introduce audiences to the sizzling speeds and daring drama that bond the multi-generational families who race in the world’s foremost desert racing organization and the second show on June 18 will spotlight race coverage of the season-opening 31st SCORE San Felipe 250. Hosts of the first ERN shows from the SCORE World Desert Championship will be SCORE champion racer Gustavo ‘Tavo’ Vildosola Jr, professional BMX rider Mike Escamilla and car artist Cherry Martini. Returning after a one-year absence to a race he relishes so much, Las Vegas’ Rob MaCachren masterfully and methodically manipulated and succinctly stormed his way past the competition and through the relentless desert race course to the overall and SCORE Trophy Truck victory on April 1 at the 31st annual SCORE San Felipe 250. The El Rey Network will air two shows around the iconic race. The first will be a one hour show on the SEMA SCORE Baja 1000 Experience at qualifying for the SCORE Baja 1000 at the Las Vegas Motor Speedway. The second will be the two-hour race show covering the historic event in detail. A Hall of Fame desert and short-course off-road champion, MacCachren, 52, backed up his top-qualifying effort on Thursday of race week to capture his ninth class win and his fifth overall and fifth in SCORE Trophy Truck in the SCORE San Felipe 250. MacCachren stormed strategically to a penalty-free winning time of four hours, 20 minutes, 15 seconds at a sterling 62.69 miles per hour in his No. 11 Rockstar MacCachren Motorsports Ford F-150. Prior to this year, MacCachren’s Overall and SCORE Trophy Truck victories in the SCORE San Felipe 250 have been in 2003 (with Gustavo Vildosola Sr), 2007 (with Mark Post) and driving solo in 2011 and 2012. Among his nearly 250 career race wins, MacCachren has also won the overall title at the legendary season-ending SCORE Baja 1000 for the last three consecutive years. While MacCachren clearly dominated a field of 24 SCORE Trophy Trucks, the remaining podium placements represented great racing efforts as well. Finishing second overall and in SCORE Trophy Truck three minutes, 55 seconds behind MacCachren in 4:24:11 (61.75mph) was defending race champion Billy Wilson, Corpus Christi, Texas, in the No. 15 Bevly Wilson Racing Chevy Silverado. Placing third overall and in the featured SCORE Trophy Truck division for high-tech, 850-horsepower, unlimited production trucks five minutes, 36.53 seconds behind MacCachren was Mexico’s two-time defending SCORE season point champion Carlos ‘Apdaly’ Lopez with a time of 4:25:52 (61.36mph) in the No. 1 RPM Racing Chevy Rally Truck. Lopez is from Tecate, Mexico. The overall motorcycle and Pro Moto Unlimited winner was the team of Mark Samuels, Yucca Valley, Calif., on the No. 1x Ox Motorsports Honda CRF450X. Samuel is rider of record this year as normal rider of record Colton Udall is out indefinitely with injuries. 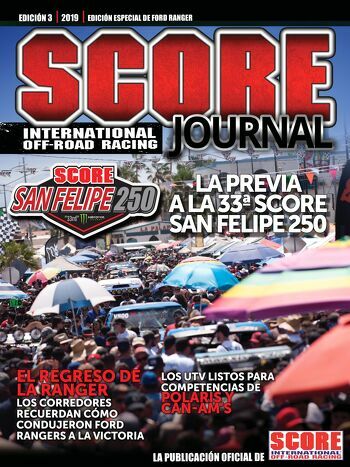 It was the second straight overall win for Samuels in the SCORE San Felipe 250. Samuels and co-riders Daymon Stokie, Australia, and Ryan Penhall, Laguna Niguel, Calif. teamed up to finish in 5:12:38 (52.18mph) to win the Pro Moto Unlimited class on a Honda CRF450X.